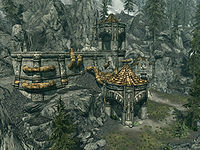 The Dwemer built elaborate underground cities near and beneath mountain ranges, including the Velothi Mountains and Red Mountain, and in the mountains of the isle Stros M'Kai. 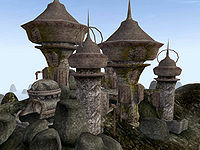 Many misconceptions about them have abounded for centuries: scholars long thought that most Dwemer ruins which dotted Tamriel outside Morrowind were mere outposts and that there were few significant Dwemer settlements elsewhere until 1E 420. The presentation of the Dwemer in fictitious but popular novels like the Ancient Tales of the Dwemer has also lodged an inaccurate impression of them in the popular consciousness, painting them as familiar, comfortable characters very similar to humans. In reality, they are better described as having been fearsome, unfathomable, and even cruel, though also careful, intelligent, and industrious. Their society consisted of free-thinking yet reclusive clans devoted to the secrets of science, engineering, and the arcane until they mysteriously disappeared around 1E 700. The history of the Dwemer is mostly a record of their conflicts with other races and each other, and the timeline is imprecise for many of these events. They purportedly settled along the coasts of Morrowind and founded Dwemereth. They became involved in clashes with the newly-arrived Chimer in the Late Middle Merethic Era over land, resources, and religion. Dwemeri culture was agnostic and preferred reason to faith, while the Chimer were staunch Daedra-worshippers. However, the Nordic invasion of present-day Morrowind around 1E 240 led by High King Vrage the Gifted brought a common enemy the Chimer and Dwemer could unite against. Although the Nords conquered all of mainland Morrowind and absorbed it into their First Empire, they never succeeded in subduing the Dwemer kingdom of Vvardenfell, which remained independent and strong. Amidst the Nords' occupation, Dumac Dwarfking and Indoril Nerevar forged an alliance which ultimately succeeded in repelling the invaders in 1E 416, leading to the establishment of the First Council and the joint Dwemer-Chimer state of Resdayn. The Dwemer appear to have been a highly technologically advanced and particularly dogmatic race. Others races have still not cracked the secret behind their metal. Their weapons were simple but effective; weaponsmiths relied on creating quality materials first, and merely allowed the form of those materials to flow from the method of the weapon's use. Their mastery of steam and geothermal power through tapping into the natural lava sources under Morrowind allowed them to create airships, sentient machines, mechanical observatories, and lighting systems that continued to work for centuries without any maintenance. Most of their settlements are still inhabited by Animunculi, enchanted mechanical guardians, commonly known as "Centurions" or "Spheres". They appear somehow linked to their place of origin, and will lose power if removed from the vicinity. This may explain why many Animunculi remain active even after so long, and supports the theory that they are strongly influenced by magic. Additionally, it appears that some Animunculi are capable of interpreting the actions of people around them - in a sense, 'perceiving' their intent - and responding accordingly. The Dwemer were somewhat comforted by their ability to empower lifeless fabrics into active beings, denying the organic power of the gods while at the same time transcending the mortal systems of life. This culture, often seen as sheer arrogance by others, allowed their technological capabilities to accelerate well ahead of any other race. 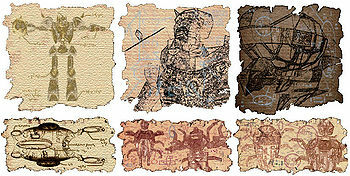 In addition, the Dwemer also appear to have dabbled extensively and somewhat successfully in some of the more divine (or arcane) arts and sought to harness the supernatural powers of the Divines within their mechanical technology, even keeping an Elder Scroll within the massive underground complex of Blackreach in Skyrim. The Dwemer had headgear known as Dwarven Miters, which gave them the ability that was known as "The Calling", which seems to have been similar to telepathy. It allowed the Dwemer to communicate with each other over great distances. Three known varieties of miters exist, with the master miter being worn by the "Tuathumz" or "central pylon" of their Thought Calling system. It contains three finials thought to be broadcast-foci. The spiked miter has spikes believed they actually functioned as "etheric antenna," helping with long-distance Thought Calls. The common visor miter lacks these features. 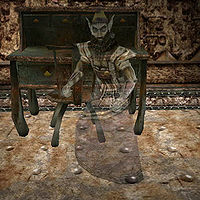 It has been suggested that, in the last moments before they disappeared, Lord Kagrenac used The Calling to summon all of the Dwemer people and rally them to carry out his plans to transcend the Mortal Plane. Whether this was related to their demise or not is uncertain.